Participants had the freedom to run, walk, swim, cycle, or use any other method or terrain they preferred. Plus, we had the luxury of completing the 3.1 miles at our own pace, in our own time, and with or without 4-legged friends. I decided to complete the 3.1 miles with Penny over the course of a few weekends so that we could get in segments at various race tracks. If you didn't already know, the Lapdog Dad races US Legends cars, and Penny attends many of the events with us all summer long. 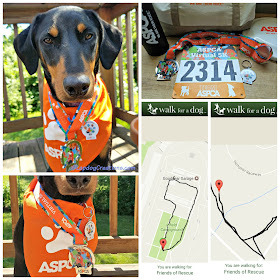 A couple of the tracks are super dog friendly and have great space for walking, so it made sense to combine our weekend hobbies and get a little more exposure for the ASPCA fundraiser. 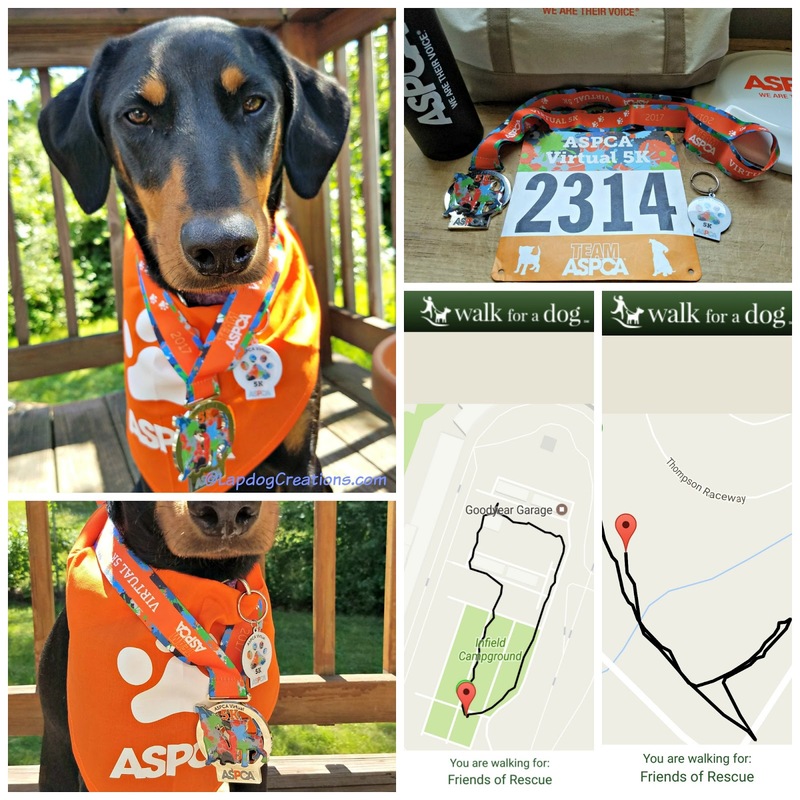 You may have noticed that I use the "Walk for a Dog" app, which meant we actually doubled up on our fundraising efforts, as our walks helped a favorite local shelter at the same time -- win, win! Thank you for helping us, to help them! 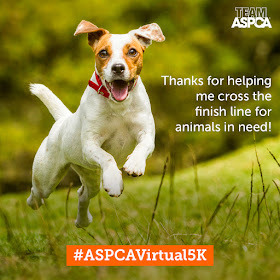 I really want to thank everyone who donated to our first #ASPCAVirtual5K, as well as those who cheered us on from the sidelines. Your support means the world to us! We fell a little short of our overall fundraising goal, but that won't stop us from continuing to spread awareness. We might even do it all over again this October, when the ASPCA hosts their fall Virtual 5K! Although the race was virtual, we still received a bib number, as well as medals for both myself and Penny (she loves bling, so I let her model both for you). The human medal is absolutely gorgeous, and the pet one can be used for a keychain if you prefer. 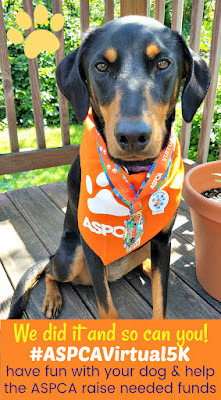 Penny also received an ASPCA bandana, and we earned four levels of prizes based on our fundraising efforts - a t-shirt, tote bag, water bottle, and running pouch. If you missed out on the June one, please consider signing up for the fall 5K! 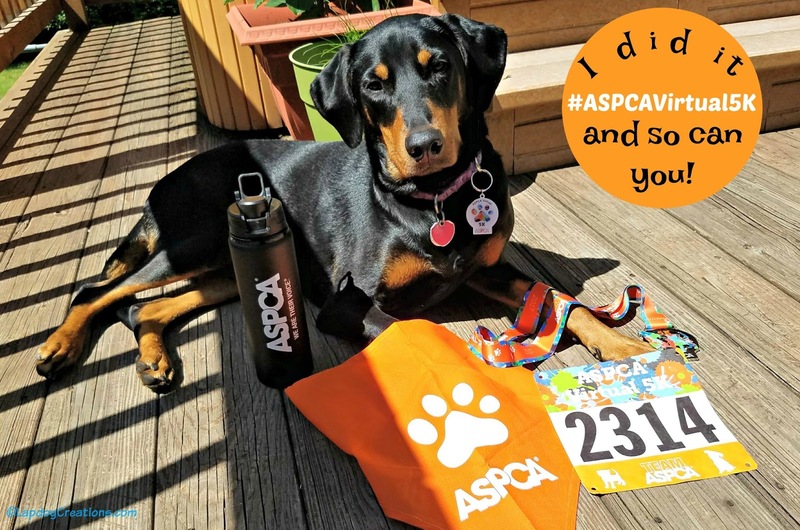 The funds you raise will help the ASPCA continue to provide local and national leadership in three key areas: caring for pets and pet parents, providing positive outcomes for at-risk animals, and serving victims of animal cruelty. I have never heard of a virtual 5K before, but I love that you could do it on your own terms. What an awesome idea!! You've been doing a lot of work for ASPCA. It's such a good cause to support. Thanks for your efforts. This is a wonderful way to give back. I am glad to hear that so many helped by donating, I love to see more 5K's like this that help animals. We had one recently in my area and I couldn't do it due to the date conflict but will keep eyes out in the future. I love the idea behind this. Being able to complete this at YOUR pace is awesome. Penny is such a gorgeous girl!!!!! Huge kudos to you both!!!!! What a great way to give back and have with your pet! I should look into this in our area! The rescue group I work with is looking for ideas for fundraisers. This looks like something I am going to pass along. Were you able to raise a lot of funds? What a great challenge! I like that participants had the freedom to run, walk, swim, cycle, or use any other method or terrain preferred. I could walk that distance but none of the other methods! Congratulations on completing the challenge! I think that was very smart of you to use the dog walking app and earn extra money for rescues. Congratulations on completing the Virtual race! I was happy to lend support to such a terrific initiative. Great job Nichole & Penny!! This looked like such an awesome event and a GREAT way to spread awareness and help raise money for animals in need. That's awesome that they're doing another one in the fall. I'll have to check that out. Love your medal! Congratulations on completing the event. I hadn't heard of it before but appreciate seeing things that help animals have better lives. Awesome campaign! I have never participated in any virtual runs before but I will definitely check this one out. Congratulations on completing this challenge. I love the idea that you could choose the activity and do it over a period of time. What a wonderful way to raise funds to help animals. Because of your post, I signed up myself and Dexter for this meaningful walk! Thanks for spreading the word of the work the ASPCA does!